The neural plate is contiguous with, and initially in the same plane as the epidermis. (We refer to the non-neural ectoderm as "epidermis" in this paper.) During neurulation, neural folds are created as the epidermis and the neural plate fold together at their common boundary. Once the folds are initiated, the amount of contact between epidermis and neural plate changes with increasing (or decreasing) amounts of apposition between the two tissues. The variation occurs both regionlly and through time. This paper quantifies these changes in embryos of the axolotl, Ambystoma mexicanum. Moury and Jacobson (1989,1990) demonstrated that reciprocal inductive interactions across the border between the neural plate and the epidermis initiate both folding and neural crest formation. The lifting of the folds is largely the result of the progressive extension beneath the epidermis of the basal and lateral surfaces of the cells at the edge of the neural plate. Basal to apical contractions of the surfaces of elongating plate cells lift the attached epidermis into a fold. More-medial plate cells extend themselves along the elongating boundary cells; their basal surfaces come into contact with basal surfaces of the epidermis and then these cells help lift the fold (Jacobson, et al., 1985, 1986). The whole process progresses toward the midline. In the amphibian embryo, it appears to us that the neural plate cells are directly crawling on the epidermal cells, there being little or no extracellular matrix apparent between the two tissues. These cellular activities produce a powerful rolling moment toward the midline (Jacobson, et al., 1985, 1986) that raises the neural folds (Moury and Jacobson, 1989) and helps roll the plate into a tube. When the boundary between the neural plate and the epidermis is severed, the neural plate does not roll into a tube (Jacobson and Moury, 1995). 1) Neural folds and crest are induced reciprocally at the line of contact between the two tissues (Moury and Jacobson, 1989, 1990), and once the folds form, the vertical apposition between neural plate and epidermis is the likely route of inductive signals from plate to epidermis that help induce epidermal placodes of the head region and, possibly, also for continued neural crest induction. 2) The cells change behavior with the result that cells of the neural plate attempt to crawl beneath the epidermis, raising a fold, and producing a powerful rolling moment that is an essential mechanism for rolling the plate into a tube (Jacobson and Moury, 1995). From serial transverse sections, we have measured the amount of contact between epidermal cells and neural plate cells in each section, and these measurements were made on embryos at each stage of neurulation. We thus describe the changing contacts between these two tissues at each level of the embryo throughout the neurulation process. The amount of contact between epidermis and neural plate changes, both in space and through time, generally increasing as neurulation progresses. Embryos of Ambystoma mexicanum were provided by the Indiana University Axolotl Colony. Embryos were reared at 17 degrees C in 10% Holtfreter's solution (Holtfreter, 1931). To stage the embryos, we used the staged series devised by Schreckenberg and Jacobson (1975) for the axolotl. Embryos were fixed in Kahle's fixative (Jones, 1966), which minimizes shrinkage, then dehydrated and cleared through an ethanol/n-butanol series, embedded in paraplast, serially sectioned at 6.4 micrometers with a calibrated microtome, and stained with Janus green and neutral red. Each section was projected by video onto a computer screen and the region of direct contact between the epidermis and the neural plate was traced and digitized. The length of the contact was obtained using morphometrics software (BioQuant IV, R & M Biometrics, Nashville, TN). The measurements of length of contact in each section are along a line that is perpendicular to the long axis of the embryo for sections taken near the middle of the embryo, but the axis is curved around the embryo, and as each end of the embryo is approached, the length of contact measured runs more and more along the axis (that is, the sections become less transverse and more frontal). These geometrical changes make the length of contact appear greater near the ends of the embryo than it would be if the sections at the ends were transverse, but does not distort the quantification of total contact. Total area of contact between neural plate and epidermis is obtained by the sum of the linear contacts at each section multiplied by the thickness of the sections (6.4 micrometers). Locating the border between the prospective brain and the prospective spinal cord. The position of the brain-spinal cord border was judged for embryos at stage 15 using the map constructed by C.-O. Jacobson (1959) for the axolotl. This position is easily seen at stage 15 since it coincides with the point where the neural plate flares outward. At later stages, the position of the "flare" moves craniad, but the level of the posterior brain boundary can be found by the positions of the emerging somites. At stage 17, the "first" somite, which later becomes somite 3, has condensed. Its cranial edge marks the boundary between brain and spinal cord (see Figs. 8 and 10 in Jacobson and Meier, 1984). For later stages, we read through the serial sections and found the boundary between the second and third somites which coincides with the brain-spinal cord boundary. Somites one and two, the two occipital somites of the salamander (Jacobson and Meier, 1984), condense later than the third somite. The amount of contact between epidermis and neural plate is shown in Figure 1 (below) for each axial level for stage 15 (mid-neurula-open plate) to stage 19 (late neurula, neural tube is nearly closed). In the brain region of the plate, contact is most extensive in the most-posterior brain region at stage 15, then the region where contact is most extensive moves anteriorly through stages 16 to 18. Between stages 18 and 19, the region of greatest contact moves posteriorly somewhat. There is little change in the axial length of the brain region between stages 15 to 19. From stages 15 to 18, the amount of linear contact between the epidermis and the neural plate in the spinal cord region of the plate is least at the posterior end and progressively increases toward the anterior end. Between stages 18 and 19, there is some decrease in contact at most points along the axis of the spinal cord region. Through stages 15 to 19, the entire spinal cord region elongates along the axis. 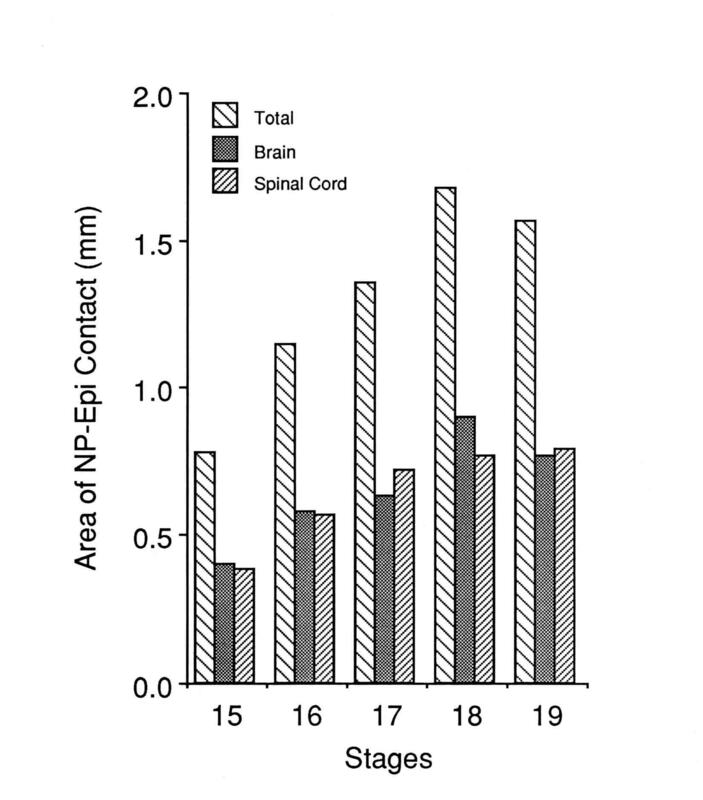 The total area of contact between epidermis and neural plate in the spinal cord region thus increases from stage 15 to 18 due both to the linear increases in the contacts at each point along the axis and the increase in the length of the axis (Fig. 2). 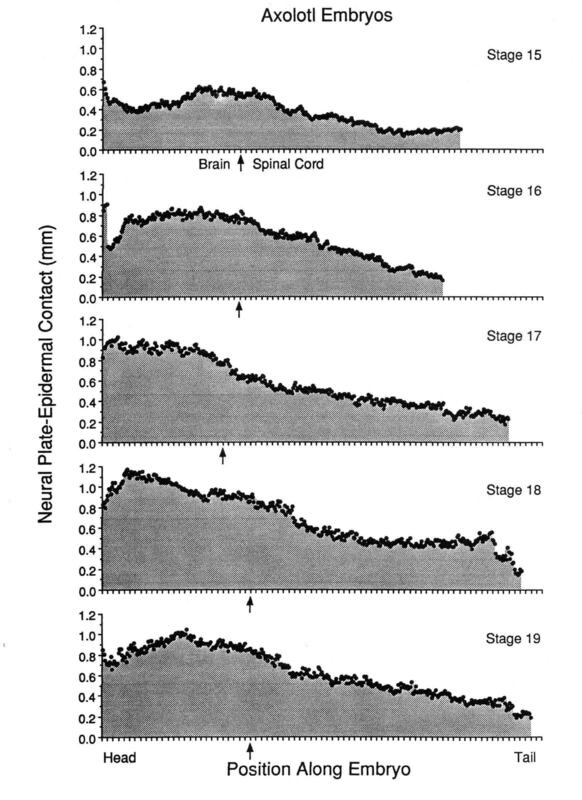 The total area of contact between epidermis and neural plate of brain and spinal cord regions together peaks at stage 18 (Fig. 2). It is interesting that the total areas of epidermal/neural contact in brain and in spinal cord are quite similar despite the appearance in Figure 1 that spinal regions have less contact at most levels of the axis. The reason that the totals for each of the two tissues stay nearly the same is that the spinal cord region elongates its axis and the brain region does not (Jacobson and Moury, 1995). The results show that there are large amounts of vertical contact between the neural plate and the epidermis from midneurula to late neurula stages. The amounts of contact vary during this period, increasing to stage 18, then decreasing. The spinal cord region of the neural plate elongates considerably during neurulation. The epidermal-neural plate boundaries elongate, in part driving the elongation of the spinal cord region (Jacobson and Moury, 1995). Neural plate cells mediad to the plate boundary intercalate into the boundary for most of the time of neurulation, and cells even more mediad are drawn toward the boundary and the plate narrows accordingly. The implication is that these more medial cells become exposed to induction signals from the epidermis as they approach and contribute to the boundary, and are converted to the neural crest line. Therefore, neural crest induction in the spinal cord region likely occurs through most of the neurulation period. 1931 Holtfreter, J. Aufzucht isolierter Teile des Amphibienkeimes. II Züchtung von Keimen und Keimteilen in Salzlösung. Wilhelm Roux' Arch Entwicklungsmech. Org 124:404-466. 1959 Jacobson, C.-O. The localization of the presumptive cerebral regions in the neural plate of the axolotl larva. J. Embryol. Exp. Morphol. 7:1-21. 1984 Jacobson, A.G., and S. Meier. Morphogenesis of the head of a newt: Mesodermal segments, neuromeres, and distribution of neural crest. Dev. Biol. 106:181-193. A pdf here . 1985 Jacobson, A.G., G.M. Odell, and G. F. Oster. The Cortical Tractor Model for Epithelial Folding: Application to the Neural Plate. In: Molecular Determinants of Animal Form, G.M. Edelman (ed. ), Alan B. Liss, Inc., New York (UCLA Symposium Volume 31) pp. 143-166. A pdf here . 1986 Jacobson,A.G., G.F. Oster, G.M. Odell, and L.Y. Cheng. Neurulation and the cortical tractor model for epithelial folding. J. Embryol. Exp. Morph. 96:19-49. A pdf here . 1995 Jacobson, A.G. and J.D. Moury. Tissue boundaries and cell behavior during neurulation. Dev. Biol. 171:98-110. A pdf is here . 1966 Jones, R.M. "Basic Microscopic Techniques". Univ. of Chicago Press, Chicago. 1989 Moury, J.D. and A.G. Jacobson. Neural fold formation at newly created boundaries between neural plate and epidermis in the axolotl. Dev. Biol. 133:44-57. A pdf is here . 1990 Moury, J.D. and A.G. Jacobson. The origins of neural crest cells in the axolotl. Dev. Biol. 141:243-253. A pdf is here . 1975 Schreckenberg, G.M. and A.G. Jacobson. Normal stages of development of the axolotl, Ambystoma mexicanum. Dev. Biol. 42:391-400. A pdf is here .